Shaman healing has been a bit… rough for most people. Our numbers haven’t been much in the way of competition compared to holy priests, holy paladins and now disc priests along side druids. We’ve got a lot of tools, but were lacking some necessary power when compared to other classes. As I’ve proven you can post good numbers and be competitive in certain environments, but it’s a lot of hard work and takes a lot of coordination. The devs over at Blizzard have definitely noticed this and have issued a response. We agree with the sentiment among some players that Restoration druids and Restoration shaman are lacking in the healing cooldown department. The shaman buff and Power Word: Shield adjustment above should bring all healers reasonably close in terms of throughput. The decision on who to bring then might end up being dictated by the strong cooldowns offered by paladins or priests. This isn’t the kind of thing we can address via a hot-fix, but it is something we are looking at for the next major content patch. First off all, the buff to purification is more than I could have hoped for. Some napkin math shows that the 15% increase, pushing it to 25% will give us a large and much needed throughput boost. This boost, if my math is right, will make us competitive with those pesky priests and paladins. While shaman everywhere (including myself) are rejoicing at this change which will be implemented in a HOT FIX (that’s right folks we really don’t have to wait for a content update for this), this isn’t the best of the news. So if you’ve been reading anything I’ve written for the last year, you know that I’ve had this sort of strange addiction to a spell that went away back in the days of early Wrath beta, Spirit Link. The devs talked about bringing it back for Cataclysm, but sadly it was was scrapped, and I shed a long and lonely tear for the death of my beloved. That however did not keep me from bringing up almost a year ago that we quite possibly needed a defensive cooldown. It would seem that this time around, Blizzard agrees. They’ve already stated that they are looking for this in the next major content patch. To me this seems to smack of the fact that it is likely we will actually get that cooldown. So, on the off chance that Blizzard reads this, I’d like to offer once again some ideas on how to make it work. I still really like this idea. It’s like a hand of sacrifice, and it plays to the whole idiom of shaman being about the group healing, and in this case group mitigation. Big cooldown, big cost. Calls upon the spirits of the targets ancestors to watch over and guide the friendly target. The guardian increases the healing received by the target by 30%, and also prevents the target from dying by sacrificing itself. This sacrifice terminates the effect but heals the target of 50% of their maximum health. Lasts 10 sec. Very similar to Guardian Spirit, but again right up the shaman’s alley. Think about it, shaman are the spiritual stewards of their communities. Often communing with the deceased for guidance, luck, a good harvest or safety. In the real world, in times of war there are accounts of shaman calling forth the spirits of their ancestors to inhabit their body for a short time, giving their actions and abilities that supernatural edge that only the departed could grant. They could also bestow this gift upon others. So this could fit as well. The shaman calls forth the spirits of the earth to imbue the target with a supernatural resilience, reducing all damage taken by 50% for 8 sec. This one is a lot like Pain Supression, slightly elevated mana cost, slightly more damage reduction, without the threat reduction. It fits with our lore, calls forth the element of earth which is traditionally the element we call on for survival. The shaman summons the spirits of the very air to protect a friendly target in the form of circling cyclones. Increases dodge rate by 80% and reduces incoming damage by 50% for 10 seconds. Air is the one element that is wildly under represented in our arsenal. We get Wind Shear, and a few air totems but that’s really it. This cooldown could be a great way to work that into the game for us. A cooldown that allows us to use the air to protect the tank, seems pretty fitting. I’m thinking something like a deterrence for the tank we can pop on them would work pretty well, just can’t make it a 100%. Now, these aren’t perfect. Not by any means really, but it’s a start. I actually have a notebook full of ideas. I mean, it’s no surprise I’m addicted to shaman in and out of game, so I’ve been jotting down ideas for well over 2 years now. So while I’m excited at the idea of getting a cooldown and my mind is all aflutter with ideas, I’m curious as to what you would want for a cooldown. What type of cooldown would you like? damage reduction? instant save from death? Well, we’ve had a little bit less then a week to get settled into our new found patch. Many things have changed. New talents tree organization for many of the classes, talents and key abilities changed or tweeked and a beautiful new instance dropped at our doorstep. One of the most anticipated changes in the patch was Dual Spec. Dual spec allows for you to change your talents on the fly (as long as you aren’t in combat) at the cost of all your mana and a small GCD effect. So the question is, what should you do with your dual spec? Here’s what I did with Lodur. According to talent chic it’s the second most popular build ( I took Healing Way over pushback resistance) I’ll likely stay that way with maybe a minor shift in talents as tier 8 gear comes in. Now after dropping my 1k gold on the dual spec ability, I had to decide what it was I was going to do with Lodur. I could pick up a melting face elemental spec, or a second restoration spec geared towards PvP. Enhancement was not an attractive option for me since weapon itemization in the end game has been lacking somewhat (fast weapons ftl). Well, I went with elemental because currently Lodur is sans arena team. Here’s what I went with for talents. Pretty cookie cutter spec, but it gets the dailies done. I found this useful on fights like loatheb where too many healers equal too much overheal, I was able to pop into elemental and just toss out some lightning bolts. I’ll likely play with it after I get into a team and learn what holes need to be plugged, but that’s the plan. This is an amazing tool blizzard has given us for raiding. It’s very nice to have a tank who can switch to dps when he does not have to tank anything, or have a hybrid class hop over into healing if things get too rough. It provides an amount of flexibility to the raid leader to fill in gaps or change strategies without having to wait for someone to go respec, summon back, re-glyph etc. One of the other additions to the game was the Argent Tournament. Wowinsider has been doing a great job keeping up with the dailies Over on WI.com so feel free to check them out for more information. The tournament feels to me very much like the Sunwell dailies. It’s placed at the far north of the map and has npc’s from all factions. It’s colorful and aesthetically pleasing and has a unique feel. It’s a tight cluster of dailies, that send you to a small selection of area in Northrend to accomplish the tasks set before you. You earn marks that you turn in to gain ranks in the knightly order, aspirant to valor all the way up to champion. It’s nice honestly. You joust, you gather items to build the tournament area, and you search for a lovely maiden’s favor. I’m very impressed with the quest line surrounding the Black Knight. It’s an interesting story so far and I can’t wait to see what else lies in store for it. I’ve just completedÃ‚Â The Black Knight’s Orders, but I’m still working on my next rank of knight. I enjoy this addition to the game quite a bit. Dailies that combine running things down with lances is always good in my book. So how are you spending your dual spec? What do you think of the new tournament? I just got off of lunch here at the office and happen to see this in my blue tracker. We are making a change to these spells so that their benefits are exclusive in patch 3.1.0. The buffs will be equivalent, but will no longer stack. 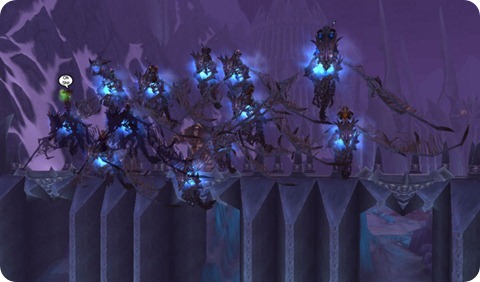 Mana Spring will affect the entire raid instead of just the shamanÃ¢â‚¬â„¢s party. We felt that both paladins and shamans brought too many unique buffs to a group. Additionally, we have been trying to tone down mana regeneration in large groups, and were concerned raids would feel the need to stack paladins or especially shaman to have enough Mana Spring totems. We have also been trying to get more benefits out of the party and into the raid, and Mana Spring previously was still a party only buff. With this change, if there is only one paladin, he or she can bring Blessing of Kings while the shaman offers Mana Spring. If there are two paladins and the second offers Blessing of Wisdom, then the shaman can offer healing or cleansing with their water totem instead. What does this mean? It means you can’t have both. They are essentially removing another source of mana regeneration from raids.Ã‚Â As you can imagine there is a large outcry among both Shamans and Paladins. From the shaman stand point I’m a little upset to be honest, I’m also waiting for the other shoe to drop. The comment about Shamans bringing too many unique buffs to the raid made me scoff a bit. Strength of Earth totem which combines STR and AGI buffs gets overridden by a Death Knights horn of winter, often times leading to that being used for Stone Skin which is negligible benefit to the raid at best. Flame Tongue totem gets over ridden by Demonic Pact if you have a demo warlock in the group, and the other flame choices are Frost Resist or doing dps. Which if you’re healing, you arent in range for that most of the time anyways, and taking the time to stop healing run in and drop a magma totem is normally not a good idea. You guys see where I’m going with this. Here were some suggestions of what we can do with the slot instead, and ultimately what our totems can add to a raid. Healing Stream Totem. It’s group only, and still has to be in range. If you’re healing, more then likely you’re going to be with the casters in the back, not taking damage. While it does have places where it can be nice, it’s largely wasted in my opinion. Cleansing Totem. Great for fights where you need to purge Diseases and Poison, but wasted and useless any other time. With curses being more prevalent then Disease and Poison that’s another totem we’ll see situational use out of. Wrath of Air. Yes we still offer 5% spell haste. Yes that is good, but it is also redundant. Currently two other classes also offer haste. Retribution Paladins and Balance Druids. Blizzard is trying to simplify raids, and I can appreciate what they are trying to do… to a point. A Lot of people think they are trying to make fights harder by nerfing mana regeneration, posts like this just add weight to that argument.Ã‚Â Homogenize every class, and then what do you have left? I posted in my last post that one of the best things about playing a Shaman was the uniqueness of our class, and totems were right up there in that list. Slowly it seems like it’s being whittled away. Streamline don’t make obsolete! Redundancy is good in a raid, but at what cost? I’ll update this as time permits today and as updates are brought to my attention. Ok, so now that my initial shock has worn off and I’ve had my cup of coffee and a chance to sit and think about it in more depth, I’m not overly concerned any longer, in fact I’m quite ok with it now. This is just another in the series of small tweaks to get everything on a level playing field. The impact to the raid shouldn’t be that big, if anything more raids will see a boost from this then any sort of detrimental outcome. I think my biggest reaction was just it seemed like a change out of left field, I don’t think anyone saw that coming. I am curious however as to what else will change in the coming weeks. Shamans have their Heroism / Bloodlust shifted slightly to keep it as a “Shotgun” buff and now the Mana Spring totem has been adjusted just a little bit. Lets see what else they tweak.